Respect in the Cage MMA Event May 19 | MMA Fighting Events Videos Techniques UFC Fight Picks and News. Mixed Martial Arts fight fans in the Los Angeles area can catch some fight action this Saturday, May 19. 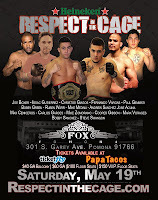 The latest installment of Respect in the Cage will be going down at the Fox Theater in Pomona, California. Check this MMA event out as the fighters will be fighting hard to earn their Respect in the Cage! The Fox Theatre features 3 levels, 3 patios, fully stocked bar, free parking and 3 replay screens. The MMA fight action should definitely be enhanced by the venue's amenities. Tickets for the Respect in the Cage MMA event start at $40. $60 gets you on the theater 1st level. $100 gets you floor seating so you can watch the fight chingasos close up. 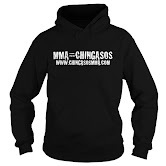 $150 gets you VIP seating so you can get the best MMA fight event experience. If you can't make Respect in the Cage at the Fox Theater this Saturday, stay tuned for more upcoming MMA events in Los Angeles and the Los Angeles area. Also, if you're a fighter or promoter, feel free to contact us to help promote your event and give it the exposure it deserves.